Mixed-Vegetables Fried Rice is always a family favorite. It is just so easy to cook and very nutritious. 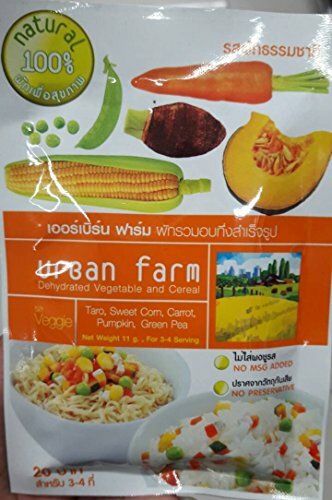 When peeking into mom's recipe, we found Carrot, Green Peas, Sweet Corns the secrets that make this simple meal a very joyful moment.Urban Farm Mixed-Vegetable rice to surprise. Perfect combination of Taro, Sweet Corn, Carrot, Pumpkin, Green Pea. Real 100% nature, no MSG and no preservative added. These Vegetables are easy to rehydrate after soaking or boiling in water to incorporate into dishes like soup, rice, winter stew and baked goods. Pack of 3 [11 grams x 3 units]/1 unit for 3-4 servings.